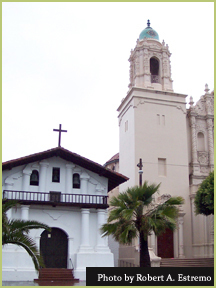 Until recently, most visitors began and ended their visit to the Mission District at Mission Dolores Catholic Church, which was built in 1787, along the trade and Christianity route in California. Today, the Mission is a crossroads for many immigrants, making it the center of San Francisco’s most vibrant street life. Not just for the 60,000 living within its borders, but also as the home of the Mission Miracle Mile which, by day, is a vibrant working-class shopping street and, by night, the coolest 20-something pub-cruising zone in San Francisco. Since the 1950s, the Mission’s dominant culture has primarily Mexican which eventually gave way to a new immigrant wave from central and South America and the Caribbean. The festivities in the Mission never end. Thousands turn out every year for the Carnaval Parade & Festival (April), Cinco de Mayo Parade (May), and the Dia de los Muertos (Day of the Dead) celebration (November). The art scene in the Mission is world-renowned for its murals, music (Latin jazz and rock musicians such as Carlos Santana); theater (the Victoria Theater, Theatre Rhinoceros, Traveling Jewish Theatre, Brava Theatre Center for Women); film (the Roxie movie house and Artists Television Access); dance (ODC and Mission Dance Theatre), and institutions like the Mission Cultural Center for Latino Arts, Galeria de la Raza and the Precita Eyes Mural Center. El Tecolote newspaper has been publishing since 1970, making it one of the longest running largely all-volunteer bilingual newspapers in the Bay Area. Frequency: El Tecolote is published every other Thursday.